I now have definitive proof: you can never have too much power. I have five separate electrical circuits in my main listening room, four of which are dedicated to audio – one 15 amp 120-volt circuit for the front-end, two 20 amp 120-volt circuits for monoblock amplification, and an extra pair of 20 amp circuits at 240-volts for non-US equipment. Each of my monoblocks gets its own 20 amp circuit. I’ve tested high power monoblocks by plugging them into a single 20 amp circuit, and then into two separate 20 amp circuits. I find that the dynamics are more explosive and the soundstage is wider when separate 20 amp circuits are used for each monoblock. 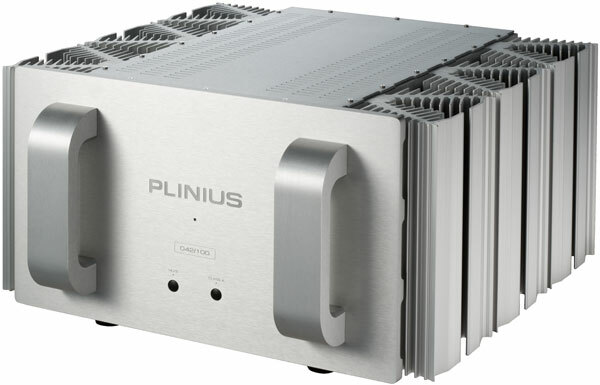 Accordingly, I told Scot Markwell of Elite Audio Video Distribution that the Plinius SA Reference would be at a disadvantage if it was compared head-to-head against high-end high-power monoblocks, both in terms of total available power and soundstage. I also asked whether anyone has reviewed the SA Reference as a monoblock. I was told that no one had yet done that. Beginning to get the drift? YES – I talked my way into reviewing TWO Plinius SA References! Well, I got my wish, and better – I got two SA References. Amps tend to be basic, no-frills components. “Features” are pretty rare. Most top amps will provide both RCA and XLR inputs. Many top amps will have 2 sets of binding posts for biamping (which I find extremely useful and wish everyone did that). A very few will include a ground lift switch. Only a handful of quality amps are bridgeable, and hardly anyone gives you the option to run them in pure Class A mode. Well, the Plinius SA Reference gives you all these. In addition, Plinius thoughtfully provides handles on both the front and the back of the unit. I really found I appreciated this. Moving large heavy amps is much easier if you can get a good grip. The utility of most of these features is rather obvious, so I’ll only comment about the two that affected me the most: the ability to shift between Class AB and pure Class A, and the ability to bridge the channels. The ability to switch between class-A and class-AB operation on the fly is very constructive. You do this via a toggle switch on the front, and this facilitates easy comparison so you can determine what sounds best to you. My impression tells me that most audiophiles will listen in Class A, but I am a bit of a philistine in that on some music I prefer the extra ounce of slam of AB to the extra pound of “roundedness” that Class A will give you. Please note that the SA Reference runs warm in Class-AB but hot in class-A. Cleverly, the designer included an internal timer that switches out of Class A after a programmable length of time when no signal is present. As a result, you can forget to switch out of Class A after late night listening without overheating your room. 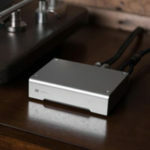 The option to switch to Class A on the fly can really add to your musical enjoyment, but the ability to bridge the two channels of the SA Reference is really the highlight of this review. In bridged mode the 300 wpc monster becomes a 1000-watt force of nature (if your electrical power is up to it). 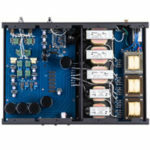 If your speakers are “bi-ampable”, you can now determine whether two SA References sound better as two monoblocks connected to the speakers in biwire configuration, or as two stereo amps in biamped configuration. Moreover, when biamping you can chose vertical or horizontal biamping, and when choosing horizontal you can run one SA Reference in class AB and the other in Class A. I will tell you now that all three configurations produced stunning results with my B&W 800D, and demonstrated that the 800Ds sound better (a) the more power you give them (even going from 600 wpc to 1000 wpc) and (b) when biamped, either horizontally or vertically. I must start with a point that applies to every usage of the SA Reference I tried: at the very least, this is the best bass amp I’ve ever heard. In case this isn’t simple and clear enough, let me explain in more detail. First, it went deep – really deep – like to the bottom of the Marianas trench (the deepest part of the world’s oceans). Playing my regular reference tracks, my B&W 800Ds went deeper than ever before. Second, the SA Reference goes deep with realistic weight. You can feel it in your gut. No lightweight bass for this amp. Third, the bass is quick, no matter how deep the note or how much weight is applied to each note. In fact, it was often quicker than amps that don’t go as deep and don’t project as much weight. Fourth, every bass note is nuanced – you can hear the strike of the note and the decay and everything in between. I will save examples of these qualities for later, when I discuss the use of two SA References as monoblocks. Through the midrange, which, despite my bass-craziness, is the most important range, the SA-Ref was totally neutral, natural and cozy. Not all that long ago, it would have been highly suspect for anyone to use the word “cozy” to describe a high-power (or even low-power) solid-state amplifier. By “cozy” I don’t at all mean that the Reference is a polite or reticent solid-state amp. I mean that it delivers eminently natural warmth when it is called for, while also being forcefully dynamic and even strident when that is called for. For example, mellow brass, such as in Chuck Mangione’s “The Feeling’s Back”, comes through as smooth and languid, with excellent richness and “roundedness”. On the other hand, attacking, staccato brass, such as Perez Prado’s “Mambo Jambo”, has the natural “bite” that you hear when listening to live performances. As for the treble, is it reasonable to describe a high-power amp as “sweet”? Well, that may be a bit over the top, although a guest of mine described it as such when the front-end was an Electrocompaniet UP-1 (review to come), but it was extremely extended without ever coming close to being strident. “I’m A Fool To Want You” on the Three Blind Mice sampler is a piece which opens with a solo piano where Tsuyoshi Yamamoto tickles the very top keys of a Steinway grand piano. Those piano notes can sound hard and glassy even when heard live in a deadened room. “Left Alone” on the K2 HD disc This is K2 HD Sound! is a beautiful and soulfully sorrowful tune by Jiang Jianhua playing the erhu (a 2-stringed “Chinese fiddle) which reaches up to the upper stratosphere. Both these pieces were gorgeously neutral when the rig was powered by the Plinius. To summarize, all of the qualities that I described in the quotes I pulled from my review of the Plinius Tautoro/SA-201 review are “amplified” (get it?) by the Plinius SA Reference. When using the SA Reference as a stereo amp I switched between Class A and “normal” operation. I found that my preference depended upon the speaker load and the amount of dynamic deep bass content. The nuances will be easier to understand after you read the description of a pair of SA References as monoblocks and also while biamping. As you will see, I’m somewhat of a bass freak, and the Plinius SA Reference, especially when configured as a monoblock, can do things with the bass that I’ve never heard before. The amps that I’ve listened to in the past that had a bridging option all lost fidelity when operated in bridged mode. This experience caused me concern, but though I tried hard to detect any loss of fidelity when the SA References were operated in monoblock mode, I could not. They were terrific sounding either way. As occurred when I used the SA Reference as a stereo amp, every tonal range and texture received exquisite treatment consistent with what you’d expect from extraordinary amps, but the bass and slam went above and beyond the call of duty. Acoustic basses not only dug deep and fast, but accurately conveyed their individual characteristics. Acoustic basses playing classical music radiated the warmth you feel when they are heard in person. Stanley Clark on Return to Forever’s “The Magician”and Jaco Pastorius on “Donna Lee”from his self-titled Jaco Pastorius plucked and grooved when playing fusion. Tina Weymouth’s bass lines in Talking Heads’ “life During Wartime”and “(Nothing But) Flowers” were fat, but fast and rhythmic. Synthesizers on Kraftwerk’s live album Minimum-Maximum came through with an ease that belied the heavy lifting being done by the SA Reference. All these characteristics manifested themselves again when I added a second SA Reference and ran them as monoblocks with each feeding off its own 20 amp outlet, but now the solidity and weight of each bass instrument really hit you. I knew from prior experimentation that giving high power amplifiers plenty of amperage really pays off, but I was still surprised at the power of the musical presentation. When using the SA Reference as a monoblock, I as a general rule preferred Class A on intimate music, and class AB on bass-heavy dynamic music. This is almost certainly contrary to what classical and jazz aficionados will do with the SA Reference – the manual itself states that “serious” listening should be done in Class A mode – but I’m a rock-and-roll fan, and I thought that rock sounded great in AB mode. To me, this is simply another example of the SA Reference’s versatility and value for those seeking high power amps. Though I couldn’t detect any fidelity loss when I switched from stereo to monoblock mode, I could also hear advantages when the two SA References were operated in stereo biamp mode. Now, you may legitimately ask me to explain the point of this exercise. Wouldn’t you always expect the addition of another amp of the same quality to provide sonic benefits? My experience is that some, but not all, biwirable/biampable speakers benefit from biamping. In my case, I had been told that biamping the B&W 800D is very beneficial, but I opted to go for high-power monoblocks, thinking that I would try biamping in the future. Well, two Plinius SA References provide the ideal opportunity to make comparisons. I first configured SA References in vertical biamp mode since this was physically easier. The instruments became subtly and noticeably more distinct, with greater solidity, air and separation. There was a bit of loss of the overwhelming slam that the SA References exhibited as monoblocks, but I can see that some listeners would readily trade that loss for the separation, especially if you listen mostly to classical or small combos. Furthermore, the added total power ameliorated any loss of slam that you might regret when operating a single SA Reference in Class A mode. There are very few speakers that can’t be driven to insane levels when biamped with two SA references in stereo mode. This led me to horizontally biamp the SA References as stereo amps, but now I could choose standard AB operation on the amp driving the woofers, while selecting Class A operation on the amp driving the midrange and treble. The instant I ran them in this mode I had two thoughts. First, I thought “Now this is the kind of flexibility every owner of biampable speakers should have!” My second thought was “Man, I gotta try two SA References as monoblocks on the bass and one as a stereo amp for the two sets of midrange and treble and run them all in Class A….” In short, I had to take a break and stop hyperventilating. The combination of Class A in the midrange and the Plinius’ already-rich and fulsome bass in Class AB was addicting, and I wanted to check out what more of a good thing might do. The only downside I encountered when operating two SA References was mechanical hum. Given the use of giant transformers in powerhouse designs, virtually all ultra high-power amps have some mechanical hum, and the only question usually is: how close you have to be to hear them. I’ve been spoiled by my Electrocompaniet Nemos, whose hum is very minimal, and I’ve reviewed several excellent amps whose hum was much louder. I listen at fairly close range – 12 feet from the speakers, and the amps are 1 foot behind the speakers in my width-wise system setup, not length-wise. The single SA Reference run as a stereo amp was not audible at 13 feet and in fact, not audible in a dead-quiet room at 7 feet; but two operating together could be heard between tracks. Though the hum was very low-level, I have worked hard to have a very quiet, near complete-silent system. Visitors never noticed the between-tracks hum, but once I was conscious of it I couldn’t help but think about it. If I permanently installed SA References as my main amps in my current listening room I’d probably add some attenuation between them and the listening position. Of course, most listeners will operate monster amps like these (and the speakers they drive) much further away than 13 feet, in which case the hum will be inconsequential. For example, the two Plinius SA References were not audible at 18 feet, which is about how far away they’d be if my room was set up length-wise. I am profoundly grateful to Scot Markwell for arranging for two Plinius SA References. Not only did I get to hear one of the best amps on the planet, but I got a vivid demonstration of what really good bass can sound like and learned that I should definitely be biamping my speakers to boot! Plinius engineers deserve kudos for the set of features incorporated into the SA Reference. Not just the obvious ones, such as dual output terminals and the option to switch between Class AB and Class A on the fly, but also the ground lift switch and the dual sets of handles. They obviously have a clear understanding not only of electronics and reproduction of audio signals, but also of the practical issues their customers deal with in their homes. The monoblock and Class A options incorporated into the Plinius SA Reference give you unprecedented flexibility to adapt them to your system over time. 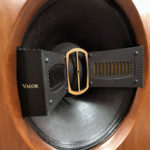 Got big, hard-to-drive speakers? Two SA References as monoblocks will drive them with power to spare. 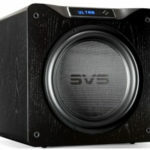 Have speakers that sound better biamped? Two SA References will sound great. Downsizing and don’t need the power of two SA References? You’re not forced to sell two monoblocks – you have a top notch stereo amp that is readily saleable. Have really efficient speakers that sound best in pure Class A? No Problem – your stereo amp can run in lush pure Class A mode. I cannot emphasize enough that you will get clear, natural and palpable midrange and treble, great soundstaging and absolutely state-of-the-art bass from the SA References in any mode. These are amps that sound great whether you’re running them as stereo amps or monoblocks, Class AB or pure Class A. You simply cannot go wrong in purchasing this product.